Here's another pattern that makes its way from knitter to knitter at my son's school. I've retooled it for you here. I most often use Lamb's Pride, but it looks great small in a lighter weight yarn and big using two different shades of gray LP held together. Of course, a Kureyon elephant would be very cool. 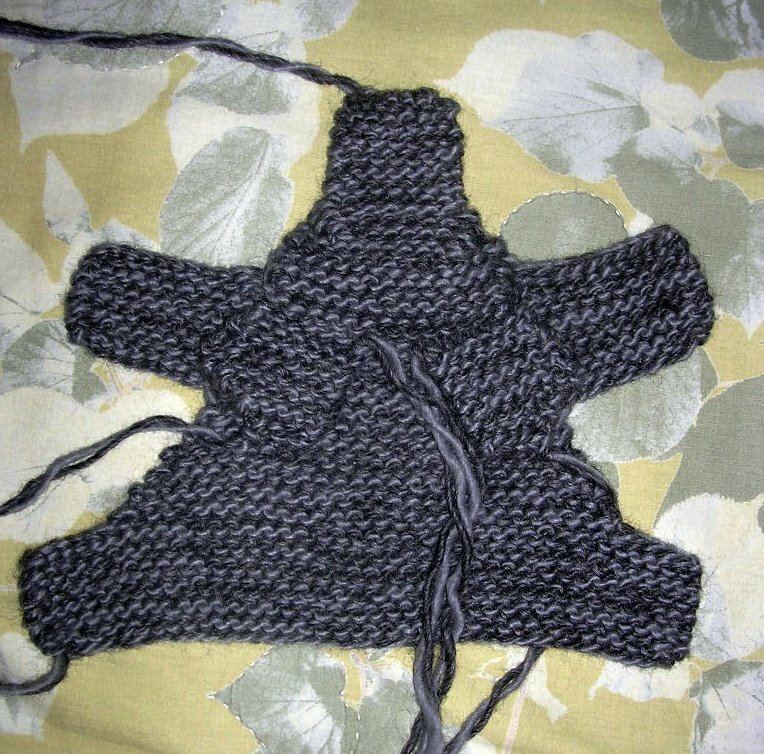 PATTERN: (The elephant's rear legs and behind are the cast-on edge and you make your way up to the trunk from there by knitting the whole body as one piece. See the photo of an unsewn elephant below.) Cast on 36 stitches. Knit 10 rows. Cast off 4 stitches at the beginning of the next 2 rows (28 stitches remain). Knit 2 rows. Decrease 1 stitch at the start of the next 8 rows by knitting the first 2 stitches of each row together (20 stitches remain). Cast on 8 stitches at the start of the next 2 rows (36 stitches). Knit 10 rows. Cast off 8 stitches at the start of the next 2 rows (20 stitches remain). SHORT-ROW SHAPING THE HEAD: Decreases and angling are achieved in a manner similar to turning the heel of a sock. Knit to within 3 stitches of the end of the first row of the head. WITHOUT knitting the last 3 stitches, turn and knit to within 3 stitches of the other end. WITHOUT working the last 3 stitches, turn. (Short rows are created across the middle 14 stitches with a gap between them and a set of 3 stitches at each end.) Knit 13 stitches then knit the 14th stitch together with the first of the 3 reserved stitches at the end. Turn and knit 13 stitches then knit the 14th stitch together with the first of the 3 reserved stitches at the other end. Turn and continue as established knitting 13 stitches and then a 14th together with a reserved stitch at the end until all the reserved end stitches are used up (the 14 middle stitches remain). Go through the short-row shaping process again dividing the 14 stitches into 2 groups of 3 at each end with 8 at the center. When you have used up the reserved stitches at each end, knit the remaining 8 stitches evenly for 12 rows for the trunk. Instead of binding off, cut the yarn, leaving a good 10 inches for sewing up, and thread it through the live stitches drawing the yarn to close. First sew the front legs threading the yarn through the edge stitches to draw the ends closed. Stuff the front legs. Using the yarn you left at the trunk, sew up the trunk pulling the yarn a bit to make it curve under. Stuff the trunk. Continue sewing and stuffing the head/neck, belly, and the rear legs. Make sure legs are stuffed firmly especially where they join the body. Sew the back seam. Add a crochet chain tail tying a knot at the end and snipping so that the end forms a tuft. Sew in all ends. EARS: From the top down of the left side of the elephant's head, pick up 7 stitches from the purl ridge that is continuous with the front of the left foreleg. Knit 1 row. Knit a second row increasing 1 at the end by knitting into the front and the back of the last stitch (8 stitches). Knit 1 row. Repeat increase row (9 stitches). Knit 2 rows. Knit 2 stitches together at the start of the next row (8 stitches). Knit the next row knitting together the last 2 stitches of the row (7 stitches). Knit 2 stitches together at the start of the next row (6 stitches). Knit the next row knitting together the last 2 stitches of the row (5 stitches). Bind off and sew in the end. Repeat the process for the other ear. (optional)TUSKS: Chain 12 stitches using cotton crochet thread and a fine hook. Attach tusks to the underside of the trunk at the second line of decreases. EYES: Embroider eyes just above the second decrease line using black floss or fine yarn and pulling back sharply when pushing the needle through the head to work the second eye to form indents. That is so adorable! Thanks for putting the pattern on here! Would a Silk Garden oliphaunt be OTT? Nah!!!! lovely, cristina. this evocation of an elephant reminds me of the torn paper creatures in co hoedeman's animation... i like that he's really perfect the way he is, but leaves space for imagination, too. Adorable! I never knit stuffed animals, and suddenly I want to make one of these. I love the Noro idea! Thank you for sharing the pattern. It's definitely something I need to do. I can't tell how big this turns out. It is very cute and I would like to make it. On bigger needles (say 6 or 7) and LP, think it would be 6 or seven inches tall? If you check out the link to Kat Coyle's blog in the permalink of this post, you'll see the elephant in her son's hand. That should help you determine how big yours will turn out. Good luck! thanks for the pattern, it was lovely to knit something simple. Hola, quisiera que vieras los elefantitos que tejí con tu patrón. Muchas gracias por subirlo, voy a traducirlo al español para que más personas puedan tejerlo y muchos niños disfrutar de él. La foto está en mi blog. 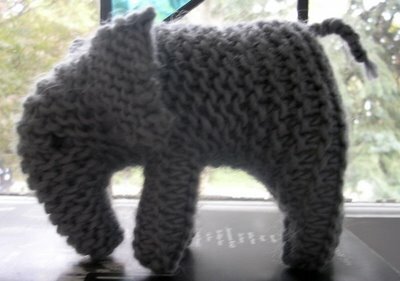 I've made a super cute tiny baby elephant. Does anyone know how to adapt this to make a mammy and a daddy elephant? I tried doubling everything but it made me a very deformed daddy elephant. Thanks in advance. can someone help me with this in german? I've done this pattern twice now and love it! I made a bigger version by using the same pattern and thicker yarn and needles (wool-ease and size 13/9mm) It turned out about the size of a football. Perfect as a baby present! Going to do it! Thank you!! I am a beginning knitter and wonder if anyone has instructions for the 2d ear. The first one is ok but I am not sure how to do the 2d one and have it be right side up. Help will be appreciated. I'm glad I made it through the instructions because my english isn't the best. That's the reason why I would like to post the german instructions in my blog linking to your original. Would that be okay for you? Yes, feel free to post the pattern in German! Adorable. Love elephants. Thanks for sharing. I'd like to make both the adult and baby bit there's only 1 pattern. Which is it for and is there a second pattern too>>? Very cute,,think will do in pink!! There's only one pattern, but the size changes depending on the weight/size yarn you use. If you double the yarn you're using, you'll get a bigger elephant. If you swatch, you'll get a sense for how the dimensions will change for the yarn you're using. Gorgeous blog post! I really impressed from your knitting. Appreciated!